No sewing FO today – it’s done, and I even wore it out, but was too lazy to get dressed today and take a photo. Soon. And while I’m on the sewing thing, can I just say – ain’t nothing like sewing to make you feel fat. Or at least like you have the hugest waist in the world. I made a pair of pants the other day, the largest size it came in (Betsy Ross “Fancy Pants”) and they were wayyyy too small in the waist. Of course, I’ve finally realized that since I don’t wear pants at my natural waist, I need to pick even bigger sizes. Like 20. Or 22. And what is up with sewing patterns? There’s design ease built in, but they don’t tell you how much – just to “fit” a magical 16 which is a 36″ bust (which I have) and a 26.5″ waist (which I most definitely don’t have). Arghhhhhhh. Anyway, enough whining. Must exercise more. Eat less sugar. Whoops. I should’ve paid more attention to the modifications I made in the raglan on the body. Riiiiip. Well, at least it’s going pretty quickly and I just have this raglan to redo and the other sleeve. I bought some Knitpicks Main Line while it was on sale ($1.97 USD, how can you beat that?!) in blueberry and cocoa, and I’m working up a sweater in the blueberry. 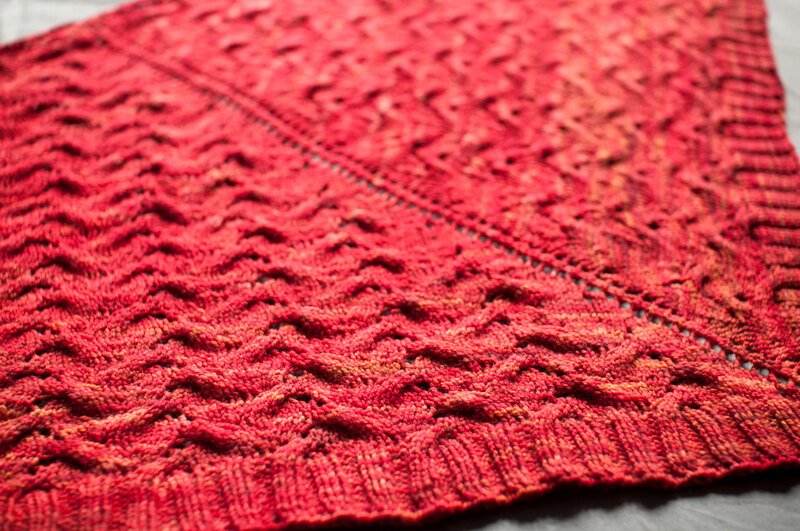 It’s based on the “Greek Pullover” from…the Interweave with the Union Square Market Pullover on it. I actually wanted to follow the pattern, but of course I’m changing it quite a bit. Can’t seem to get away from that. The yarn is nice, but it really is quite heavy! Much thicker than I was anticipating. It’ll be a quick knit, I think – I already had to rip out 3″ that I’d knit yesterday, but am back on track after some quality TNG time. I’m in a mood tonight. A cranky one, can you tell? I’m working on sewing up a dress out of that brown paisley, and I chose to do the size 8 based on a recommendation – the bust is very oversized (44″!) and I didn’t want to be swimming in fabric, so I emailed Erin of a dress a day, who has made the same one, and asked her. Turns out we have about the same measurements (including the thick waist) and she said the 8 was good. But I’m worried. Oh well, if it’s too small I can either a) run more often and lose some damn weight (would also help in the fitting into the clothes I have department) or b) give it to someone smaller. For what it’s worth, sewing patterns generally LIE LIE LIE when it comes to sizing. I never buy a pattern based on the sizes they offer, but flip the danged thing over and take a look at the measurements they give. And then I buy two sizes bigger that the outrageously huge size they list as matching my measurements–just in case. It’s not you. Have some sugar. I love that blueberry colour, it’s fantastic! ps. sorry to hear about your container garden. There’s an industry standard for ease. “Loose-fitting” is so-and-so bigger than actual measurements and so on. You can tell the individual pattern’s ease by comparing finished garment measurements to body measurements provided on the pattern envelope, the instructions, or occasionally on the pattern tissue itself. The latter are most annoying because it’s not very practical to look there before buying the pattern. What everybody else said. i don’t see the point of putting a numerical size on patterns at all (8-10-12, etc) b/c everyone just goes by the measurements anyway. also, when are the pattern companies going to figure out that modern women don’t wear pants on their natural waists anymore? for what it’s worth…i’ve found that vogue/burda patterns tend to actually fit the measurements that they tell you on the back, while mccalls/butterick/new look/simplicity all have a LOT of ease. The garment industry uses a pretty odd, and at time VERY frustrating system for sizing and labelling. I advise figuring out (or finding someone who knows) REAL numbers and conversions, and never look back. That being said, there is nothing like TNG for catch-up knitting. I’ve started sewing some clothes recently. I highly recommend that you check out some books by Sandra Betzina — she does a great job explaining how to determine fit and make alterations for “non-standard” bodies :) I also have a thick waist, and I am planning to make some pants soon, using one of the patterns she designs for Vogue (Today’s Fit, I think they are called). Do check her out! Those sewing patterns sound maddening – even worse than knitting patterns for sizing! Hopefully you get it sorted out. Sewing patterns LIE. I usually fit into rather small clothes at the store, but sewing patterns say I’m their largest size? So I take their recommendation and end up with a tent. Besides, we’ve all seen pictures. You look just fine. I seem to be coming at this from the opposite end of things – I prefer sewing pattern sizes to rtw sizes, because at least they’re somewhat consistent! I also sew most of my clothes, so I’m more used to pattern sizes that rtw sizes. As long as you know they’re different, you’re good to go. Check out the current issue of Threads magazine for help on choosing pattern sizes. The large pattern companies will almost always have the actual garment measurements printed either on the envelopes, or the pattern tissue. (It used to be on the envelope more often – I’m frustrated that it’s usually on the pattern tissue now! I’ve become good at knowing how to find the measurements quickly and sneakily while I’m still in the store.) With a bit of experience, you’ll get a feel for how the patterns from differrent companies will fit you. I highly recommend Burda patterns; the fit is generally more refined and careful than, say, McCall’s. Check out patternreview.com if there’s a pattern you’re eyeing – they post reviews by people who have sewn that pattern, and you’l be able to get an idea of what the isuues are with a pattern, and what the fit is like on real people.